It seems a long time ago when the month of December would ride on the buzz around new film releases in Bollywood. Don’t get me wrong. Films are still releasing, of course. But does anybody really care about those fresh-off-the-boat trailers more than the wedding photos of the actors in question? Turns out in tinsel town, pyaar has nothing on PR. Back in May, Sonam Kapoor’s wedding photos, videos and Insta stories gained more views than her film Veere Di Wedding, which followed close on the heels of 'Sonam di wedding'. In fact, a famous comedian had observed how the actress had an entire wedding to promote her film. We don’t know if Ranveer Singh attempted (or is attempting – is it over yet?) something similar for Simmba but this is again the curious case of timing. Priyanka Chopra’s dreams, of course, have always been larger than Bollywood can accommodate. She may not have a film to promote, but she sure walked away with no less than Sansa Stark and PM Modi, and a Ralph Lauren veil that has room for a lifetime of memes. Priyanka Chopra and Nick Jonas' wedding reception in Delhi. I think it all began last December when Virushka set the template for a perfect Instagram wedding with their dreamy Tuscan affair. It was just the kind of secrecy and a charming reveal one associates celeb weddings with. Far from the madding crowd, boy, did they know how to keep a secret. And as the first picture hit social media, in its perfectly colour coordinated splendor, the nation went crazy. And Bollywood got its cue. Just like how one Golmaal makes way for three more, Bollywood found a new superhit formula – weddings! First came Sonam Kapoor who let us sample everything in her wedding, except the food. There, it was the opposite of Virushka’s “no cellphone” rule (that DeepVeer would go on to impose a year later). Bring your cellphone, bring two if you can. Take as many videos as humanly possible and crash social media. The guests obeyed. Deepika and Priyanka may not have competed as much in Bajirao Mastani, as they did on their respective shaadi ka mandaps. Or am I overthinking this? The budget is similar, if not more, who knows? There is venue, set design, costume and of course, the guest list as members of the supporting cast. While in Bollywood, there’s box office moolah, in starry starry weddings, it all translates into social media currency. And in PC and Nick’s case, real currency too, what with their “of the People, (almost) by the People and for the People” wedding. Rumours are uninvited guests at celeb weddings and unfortunately, for the hosts, turn up in large numbers. There were loud whispers on how Deepika trending as #worldsmostbeautifulbride on the day of her wedding may not have been the most organic Instagram trend. Her follower count too miraculously shot up, beating that of Ranveer, just before she released the wedding pictures. Speaking of photos, this couple made the nation wait longer than the Supreme Court verdict on Section 377. That the photos hogged as much media space as the landmark verdict, is of course another story. And then Priyanka went one step further (surprise, surprise) to ensure her wedding smile is literally a million dollar one. Or make that…nah, who am I to count? A still from one of Deepika and Ranveer's wedding receptions. Nothing can be on the scale of normal anymore. If non-celeb brides and grooms are pulling all the stops to reach the stars, where will the stars go? I don’t think even they know. DeepVeer has been pulling out reception parties at such a pace, that if they now declare that they are done, no one’s gonna believe them. 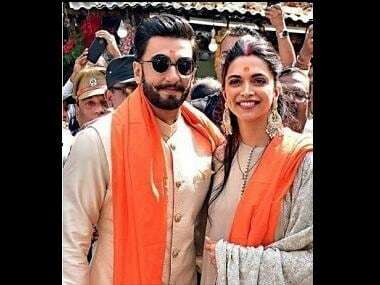 We cannot say for sure who all Priyanka had planned on inviting from Bollywood but if some of them were invited to both weddings, they would not have had time to travel between the two, what with DeepVeer’s endless stream of receptions overlapping PC’s celebrations. If one had Sabyasachi, the other had Ralph Lauren; if one had a lake, the other had a palace (fairytale weddings, remember? ); if one scored Bollywood, the other scored the Prime Minister. If one had a “secret” wedding , the other went all out to ensure the world witnessed each well-choreographed shot. We don’t mind the photos, in fact, bring them on. All you superstars look great, your clothes are beautiful, your styles, impeccable. But, if you keep screaming “look at me, look me at me!” it can get tiring after a point. We understand it’s shaadi in the time of social media, and all this is one giant, multi-million dollar Instagram filter. But, are we done yet? Someday we may find the answer to how far is infinity, or does God exist or does this senior superstar wear a wig? But, we will still nowhere be close to knowing how much is too much when it comes to star-studded celebrations. The funda seems to be: Marriages may or may not last forever, but mine will be bigger than yours. Ever after. As for us, mango people, we can only hit the ‘like’ button and let them eat (an 18-foot) cake.